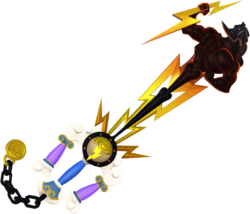 The Hero's Origin is a Keychain for Sora's Keyblade in Kingdom Hearts III. The blade consists of a series of thunderbolts topped by Zeus. His arm and the large thunderbolt he is holding make up the teeth. The handle consists of Olympus-style clouds and columns, topped with the symbol of the gods of Olympus. The keychain is the Olympus Stone on the end of a thick black chain. Concept art of the Hero's Origin. This page was last edited on 18 April 2019, at 21:22.